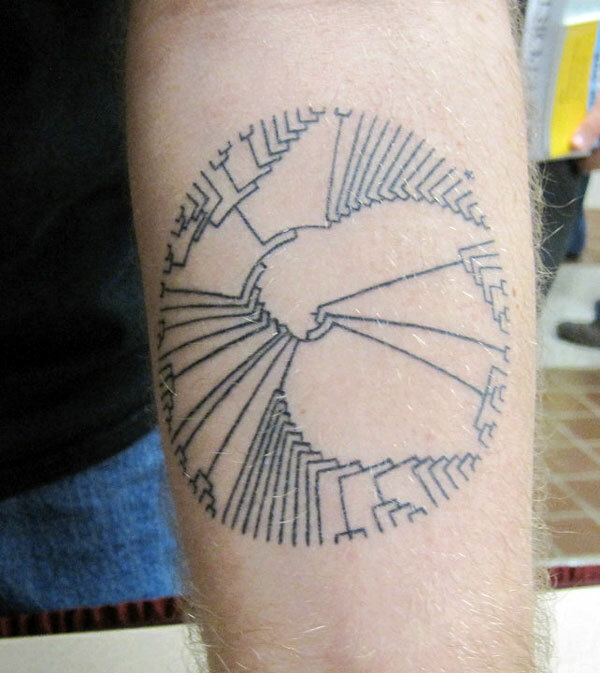 Tree of Life tattoo, courtesy of Clare D'Alberto, who is working on her Ph.D. in biology at the University of Melbourne. (7) a mollusc (nudibranch); (8) an echinoderm (brittle star); and (9) a vertebrate (Weedy Sea Dragon). 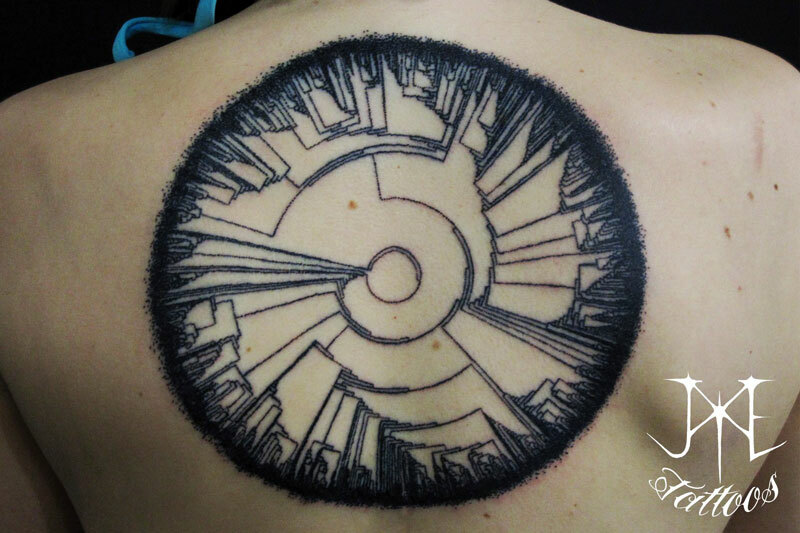 Here is another great Tree of Life tattoo! This one is courtesy of Monica Quast, who is a Ph.D. student at the University of Campinas, Brazil, working on bivalve phylogeography. 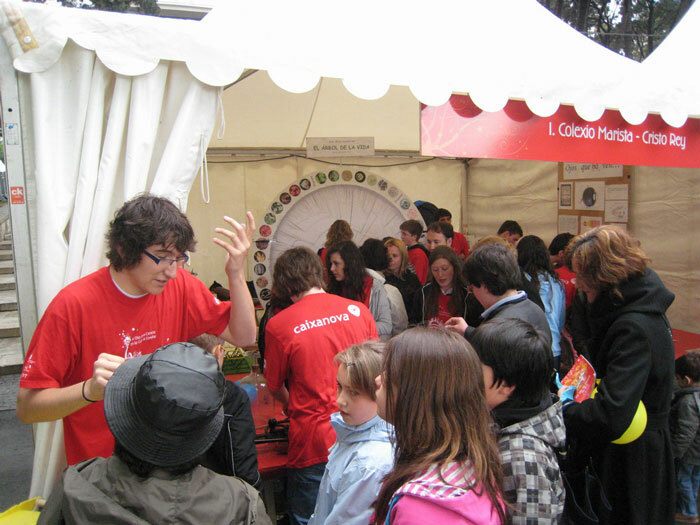 The organisms depicted on this version are (going clockwise): a cyanobacterium, a foraminiferan, 3 diatoms, an oak leaf and acorn, a Spirogyra cell, a red cage fungus, a stauromedusa, a nautilus, a tardigrade, an ophiuroid, and a badger. 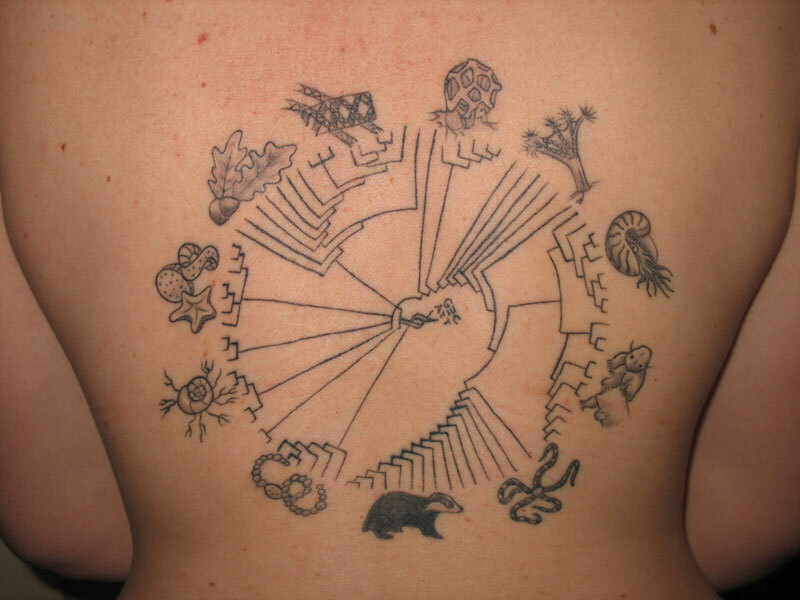 Monica's tattoo is based on the Tree of Life we used in Life: The Science of Biology (Sinauer Associates and W. H. Freeman; see the last image, below for more information). 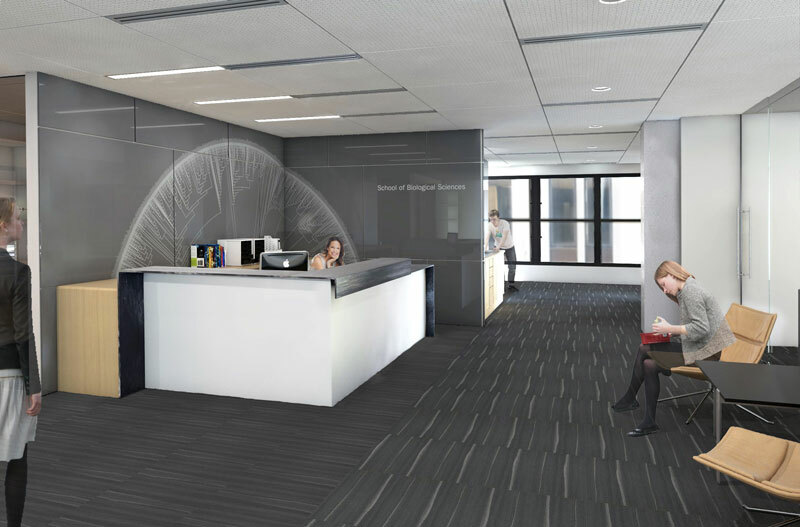 Here is yet another version from Hannah Udelll at the University of Wisconson-Madisson. 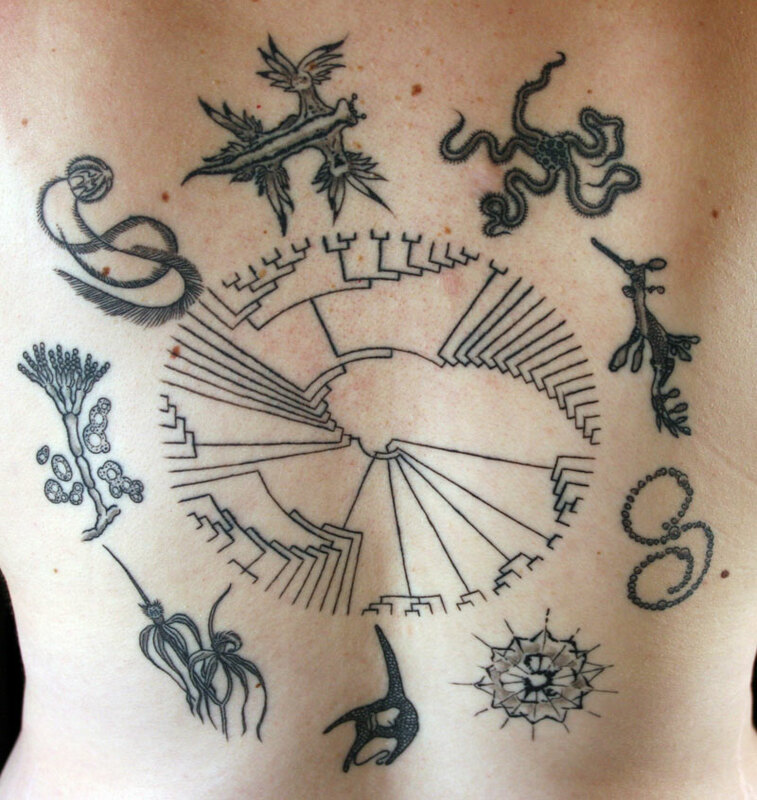 In this version, the tattoo artist used stippling and included the full tree, but stippled the species names for an artistic look. between them) as well as from the experts (for the level of knowledge of our students and the development of the experience)." 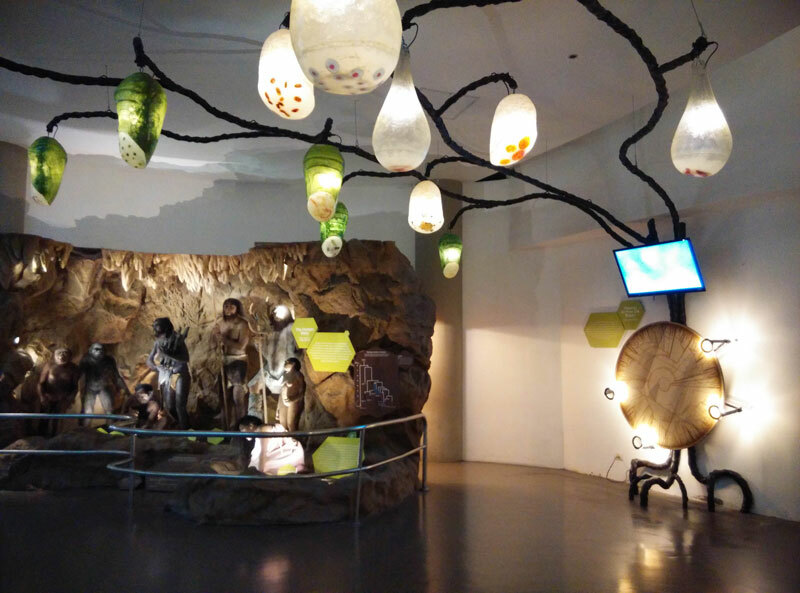 At the Mind Museum in the Philippines (below), they have produced an exhibit their Life Gallery about the Tree of Life. 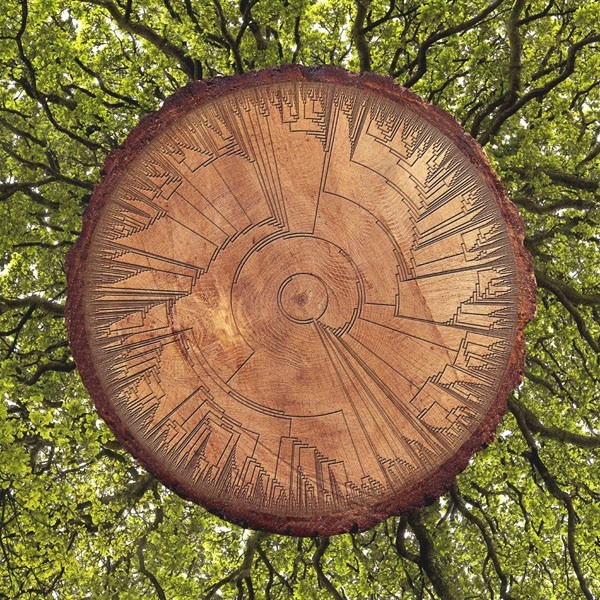 Kai Pobre, the Exhibit Manager, explains the exhibit: "We have the Hillis Plot at the tree trunk [etched in wood] where guests can read the names of the various species through a magnifying glass. 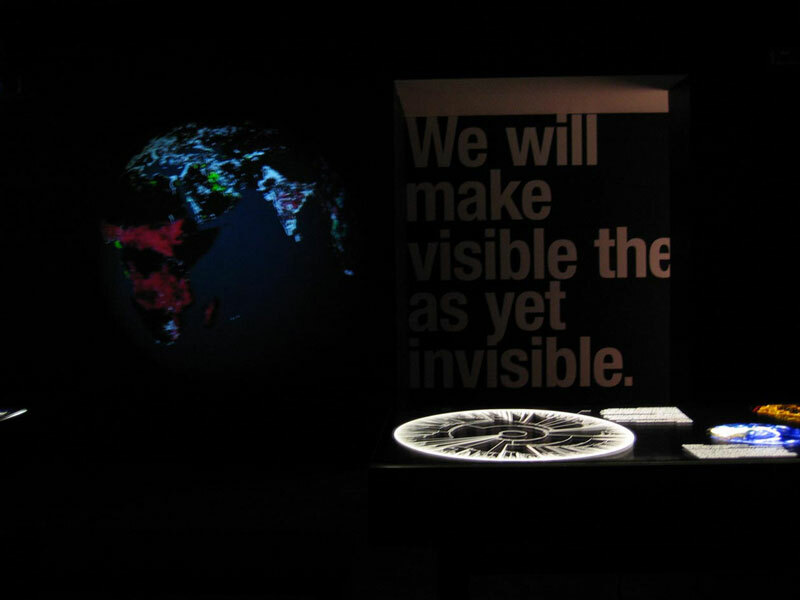 Above it is a video that shows the Theories on How Life Began. 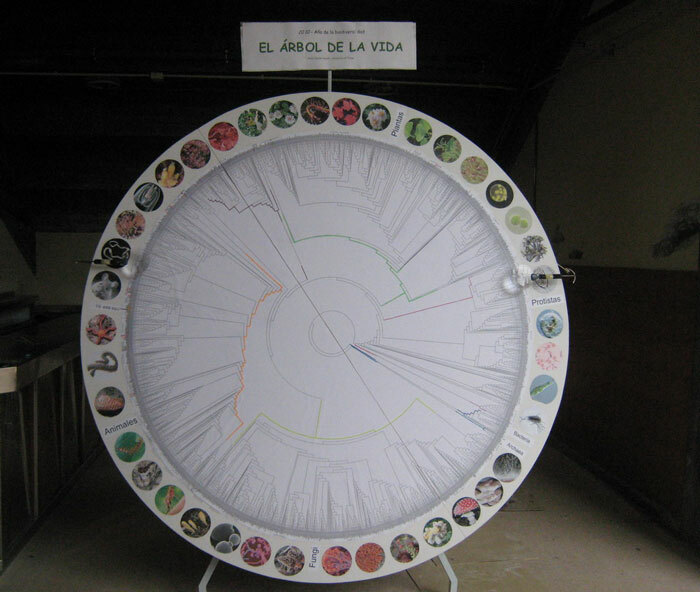 The tree [growing up from the plot] is made of metal showing the branching of Archea, Bacteria and Eukaryotes while the organisms are made of resin cocoons and sculptured wires." 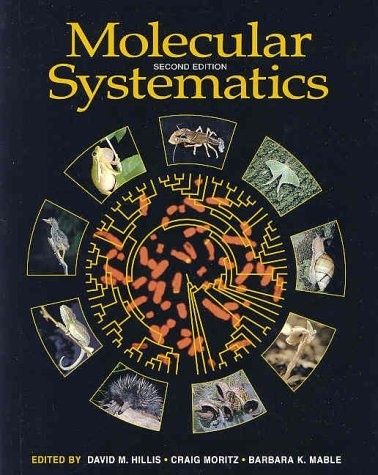 by D. Sadava, D. M. Hillis, H. C. Heller, and M. Berenbaum (Sinauer Associates and W. H. Freeman, 2011). 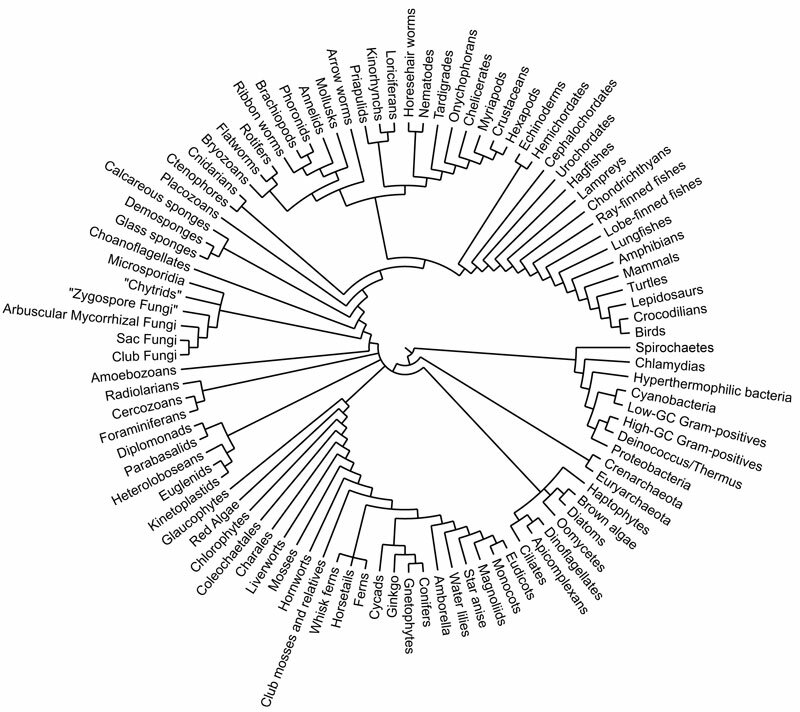 and highlight the respective clade on the tree. The pdf for this file is 35 kb. This one has made it into tattoos as well, as on this unlabled arm tattoo (courtesy of Joel Klinepeter). 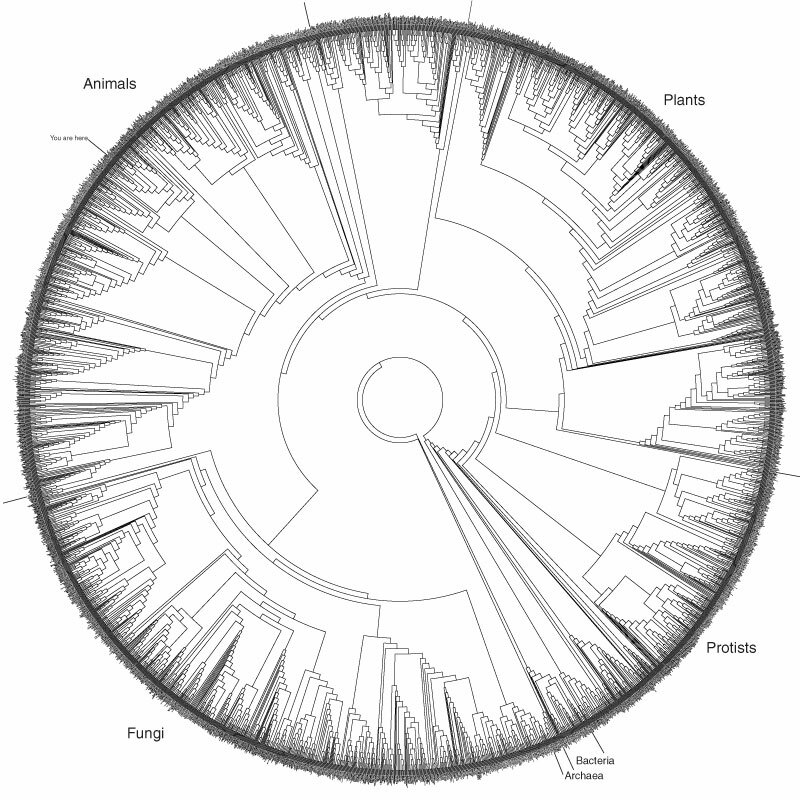 Notice the asterisk, signifying "You are here!"